The team stretching their legs after two sedentary days snowed in. 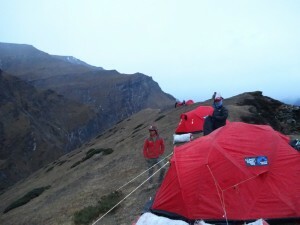 Our Pangi ridge camp is in the background. I just arrived home from Kathmandu yesterday evening after a month in the remote Dolpo region of western Nepal. 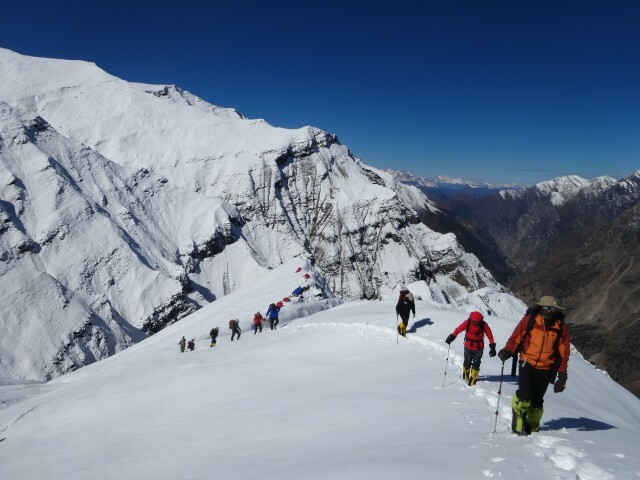 Nine of us plus guide and sherpas were attempting to climb Putha Hiunchuli (7246m). Being home for such a short time, I’m struck by the juxtaposition between my life here and what I’ve been living for the past month. I thought I had masses of stuff out there – two full duffel bags and a bit extra in a rucksack. But I’ve come home to a shelf full of makeup, boxes of stilettos piled behind my bedroom door, kitchen cupboards full of different shaped glasses and variously-patterned mugs, and I almost miss the simplicity of a face-wipe and a metal cup. It has happened before. These superfluous things will soon become normal again. Besides readjusting, I am able to reflect on the expedition. It was not a success in black-and-white terms. We didn’t summit Putha Hiunchuli – we didn’t even come close, not even making it to base camp – but I don’t feel disappointed despite the implications for my future plans in not having attained the altitudes, and thereby gained the experience, I would have liked. The expedition was a success in that as team we walked into a remote region, dealt with various surprises and issues that befell us and remained safe, well, happy and unified. We were caught up in a cyclone that unfortunately caused several casualties in Nepal. 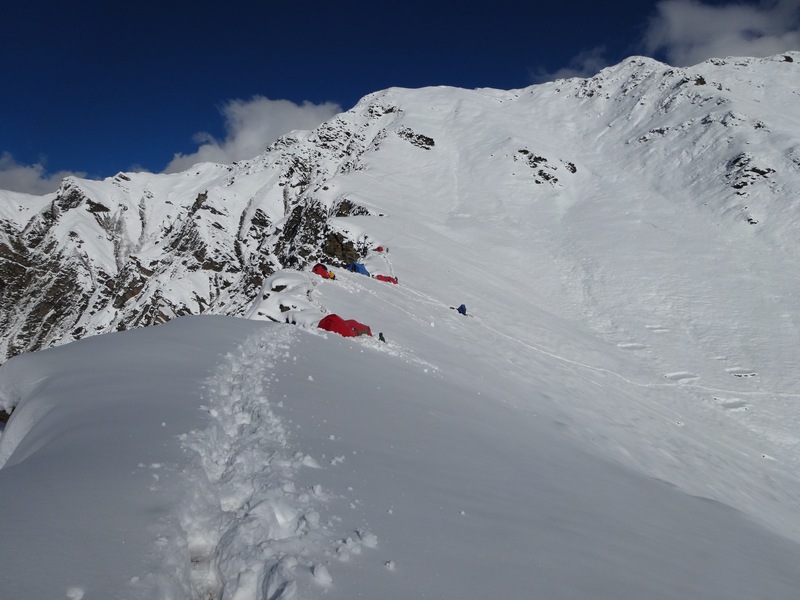 But we had up-to-date information and strong leadership and we set ourselves up somewhere safe, at the top of the ridge above Pangi Camp, out of the main avalanche risk area. 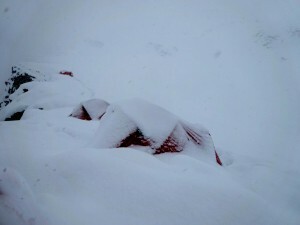 We were snowed in at 4500m for several days. 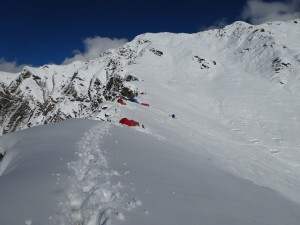 The snow was deep and impassable to the yaks that usually carry expedition equipment to base camp. We couldn’t get up, but equally there were others there who couldn’t get down. I summarised our predicament to the tune of the Bee Gees Tragedy, which will serve here as an unofficial trip report. At this level we can’t expect all our expeditions to result in a summit. There are too many factors that need to come together and many are out of our control. Failure always teaches us something, but I don’t even think of this as a failure. It was a beautiful experience. And I’d like to thank my entire team – westerners and Nepalis alike – for inspiring, supporting and amusing me for the past month. I will miss you. The ridge when we arrived, just before the storm. The ridge after the storm. great piece of emotive writing Melanie. I think you were brave – the pictures and the poem tells it all! You must have gained a lot of usefull experience. To stay put at 4500 meter for several days wondering how to come down and back, must have been a challenge. The warnings you received were of the greatest importance, and clever of you to act as you did. Would be interesting to know more about how you reached the conclusion to change plan and put the tents safe of avalanche danger but you must have been very exposed to the wind. I have read reports about how poor the weather-forcast was in Nepal before the cyclon struck. Will try again this year, since the knee is better now !